Chilis Chicken Crispers copycat recipe is a great way to enjoy the original Chilis Chicken Crispers at home. It’s amazing to find out that what started in 1975 as a funky little hamburger joint named Chili’s, in what was originally a post office in Dallas, Texas, has turned into an international eatery chain with more than 1,600 Chili’s in 33 countries. Only in America! To read more about the history of Chili’s, click here. Did you know that there’s one photo hanging upside down in most Chili’s locations? If you’ve never noticed, take a look the next time you go. The tradition appears to have begun with the very first Chili’s when a photo was hung the wrong way on purpose. The upside down picture symbolizes that good luck will arrive for everyone that eats at Chili’s. Another reason to eat there, besides the delicious food! 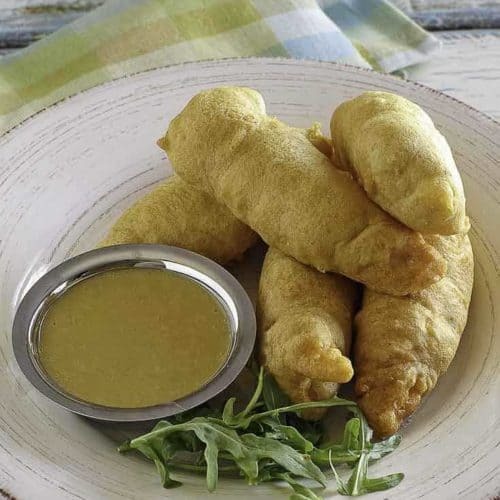 These crispers stand out because they are a delightful international cross between a tempura texture (Japan) and a fish and chips texture (Britain). The yummy batter is so smooth, light, and super crispy that you’ll find yourself sneaking morsels of it while still cooking. Yes, Chili’s does use MSG as a seasoning accent. However, my recipe swaps out the MSG for chicken broth, which works well to produce the same flavor. Two “honey” favorites at Chili’s are Chili’s Honey Chipotle Sauce and Chili’s Honey Mustard Sauce. These are also easy to make at home, and I tell you how to create them below the recipe for the crispers. What Goes with Chili’s Chicken Crispers? You can serve these delicious crispers with potato wedges, coleslaw, crispy sweet potato fries, or potato salad. Chili’s Chicken Crispers have a wonderfully delicious crispy crust. They’re real easy to make at home, and the batter is also great for fish! 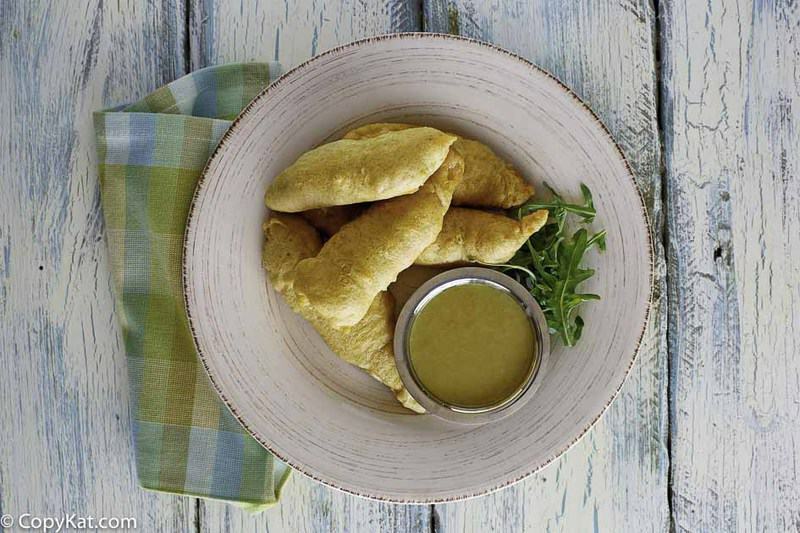 Chili’s Chicken Crispers will be a favorite with you and your kids. What is your favorite menu item of Chilis? What recipe do I need to tackle next? Let me know in the comments!! You can make the classic Chilis Chicken Crispers at home. Make the batter by first combining the club soda and the egg together. Whisk together until they form a uniform mixture. Then add in the dry ingredients: 1 1/2 cups flour, baking powder, salt, pepper. Stir together. Allow the batter to sit for a few minutes. Remove chicken from package and pat dry with a paper towel. Dredge the chicken with the 1/2 cup flour. Preheat the oil to 350 degrees F. Dip chicken into the batter an fry a few pieces at a time. If there is any additional batter left over, could make some onion rings, but the excess batter should be discarded. 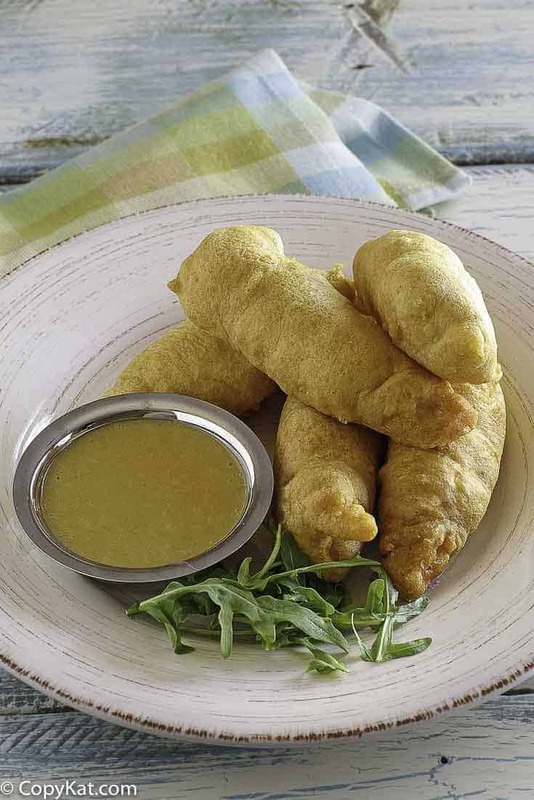 Prepare honey mustard by combining the mayonnaise, dijon mustard, cayenne, and honey. Stir well. You can store the honey mustard for about a week in your refrigerator. Tools recommended for this recipe. I personally really love my TFal deep fryer. It makes deep frying a snap. I have made a lot of your recipes and love them. Thank you for keeping dinner interesting! I just had a quick question: can you cook these in an air fryer? Or do they just get messy? I’m trying to avoid digging out the deep fryer in January because it will stink up the house. Thank you for enjoying my recipes. I think this recipe would not work in the air fryer. Typically items are breaded are suited for the air fryer, food that is battered doesn’t work, because the batter slides off before the cooking is done. The calories shown is 609 and the recipe serves 4. Are the calories 609 per serving or the entire recipe. Just seems like an awful lot if it is per serving. I love Chili Chicken Crispers, would love to make your recipe but not sure about those calories. Thanks for sharing. You mention chicken broth, when do you use it? Thank you for all your recipes, my family loved this one. I liked the old fashioned crispers the best, and these hit the mark, and made me run all the way to the finish line. I can’t wait to try this recipe!! Thank you for sharing! Loved these, even more, when I made them at home. I served them with Buffalo sauce. You can get them like that at Chilis. I have commented twice and my comments have been removed. You mentioned club soda so I was just wondering where in the recipe is it used? The club soda is listed in the ingredients, it is the 7th ingredient in the chicken crispers, and then it is in the first sentence in the instructions. So I believe I have this covered. If I have failed to explain this let me know. Thank you for all your recipes Stephanie I’ve tried quite a few and have enjoyed them immensely. These are for the original crispers, the honey chipotle ones are made differently. I haven’t worked on that recipe yet. I made for dinner everybody loved it. Very easy on a busy day. I am glad to hear you enjoyed the chicken crispers! I want to try these with some Chick Fil A Sauce sometime. Club soda makes the batter fluffier . Thank you for all your recipes Stephanie I’ve tried quite a few and have enjoyed them immensely. This recipe looks pretty good to me too. I thought I saw the recipe for Chili’s Jalapeno Aioli on your site a while back, but have been unable to find it again. You wouldn’t by chance have a copykat version for that on hand? I would really appreciate it. Have a great weekend, it’s almost upon us. Sounds mouth watering good…..I am new on this site, and so far enjoy what I see. Thank you Sherry! Much appreciated!